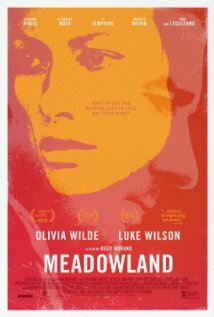 Movie Review: Directed by the cinematographer Reed Morano from a screenplay by Chris Rossi, “Meadowland” is a poignant drama that demonstrates how people can descend into very dark places after going through a deeply grievous situation. The unimaginable happened to a happy couple of New Yorkers, Sarah (Olivia Wilde) and Phil (Luke Wilson), whose life will never be the same after their son’s disappearance. Everything happened when Phil decided to stop the car at a service station to buy some drinks, taking the opportunity to send the little Jessie to the restroom. Phil becomes restless when Jessie, who had locked the door, doesn’t answer to his calls. When finally inside, they face an excruciating reality: Jessie has vanished through a backdoor that connects with a garage where nobody was working at the moment. One year after, we find the devastated Sarah at home, still under the effect of lithium, getting drunk in front of Phil, who misleads us to believe he’s coping a bit better with the situation, taking into account his genuine concern with her and observant remarks. With them, is Phil’s brother, Tim (Giovanni Ribisi), a melancholic character, with a guessable troublesome past, who asked to stay at their place for an undetermined period of time. He clearly functions as a sort of an extra burden to the pair of sufferers whose emotional distance increases every day, making them suitable to fall into questionable behaviors both at work and outside work. Sarah is a school teacher, and after the initial attention with a problematic girl whom she followed the steps of listening to heavy metal and cut herself on the arms, she develops a fixation into another student, Adam, who has Asperger’s syndrome and is rejected by both his mother and schoolmates. She urgently tries to fill her emptiness by acting like his mother. In turn, Phil is more and more unmotivated in his duties as a police officer and even the therapy sessions he continues attending don’t seem sufficiently rewarding to make him recover the lost balance. He shows a pitiful moral degradation and a hopeless lack of confidence that made me uncomfortable. The experienced casting director, Phil Hicks, did a great job since these actors, with no exception, made the difference in turning a pretty conventional theme into a compelling dramatic creation. Only the surprising final scene sneakily attempted to be something more transcendent than it was really felt. Mr. Morano revealed sensibility in terms of camera work and a complete control of light in order to extract warm, opaque gleams from the visuals.